There is a DVD documentary playing on the second floor that shows the effort that went into the making of the first “megaplanet“. What you can’t possibly capture from a photograph of one of these masterpieces is the depth of the work. These megaplanets are over a foot in diameter, and start with a small, apple-sized ball of glass that is shaped with water-soaked wooden bowls and paddles. 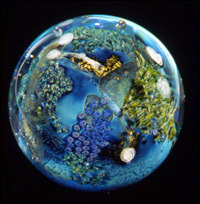 Colored bits of glass, including millefiori canes, as well as metal foils and other materials, are attached to this base piece, then the piece is dipped in the pool of molten glass again. This process is repeated six or seven times, each time building up another layer, adding depth that can only be seen in person to appreciate. Now, Peg and I know something (well, a little bit) about glassblowing. Peg took a course in it, and one day I went along just to watch, and the instructor insisted that I make something just for fun. So I made a paperweight about the size of an egg. Inside the furnace was a crucible containing probably a couple hundred pounds of molten glass at approximately 2200F. Yup, it was close to red-hot, that nice orangey color when you know something is really hot. That day pretty much redefined hot for me. I had worked with plastics at 450F, nylon at 550F, and some other stuff, like metal work, that ran into the close-to-red-hot region, but this stuff was hot! But my paperweight was about two or three ounces of glass, consisting of a starting glob about the size of a small walnut, with some yellow glass stuck in, and one more dip in the molten glass (and a lot of nerve-and-heat-related sweating!). Josh’s Megaplanets are, oh, like 100 pounds of glass. While the artistry involved is unquestionably wonderful and beautiful, the engineering work and the sheer scale of the megaplanets are just mind-boggling to me. Very very impressive stuff, and I heartily recommend seeing the exhibit, open November 20, 2007 through February 3, 2008. Admission is only $10, free to Springfield residents. This was written by admin. Posted on Thursday, November 29, 2007, at 1:48 pm. Filed under Uncategorized. Bookmark the permalink. Follow comments here with the RSS feed. Post a comment or leave a trackback.